Do you need an easy recipe, perfect for picnics and packed with fresh vegetables? 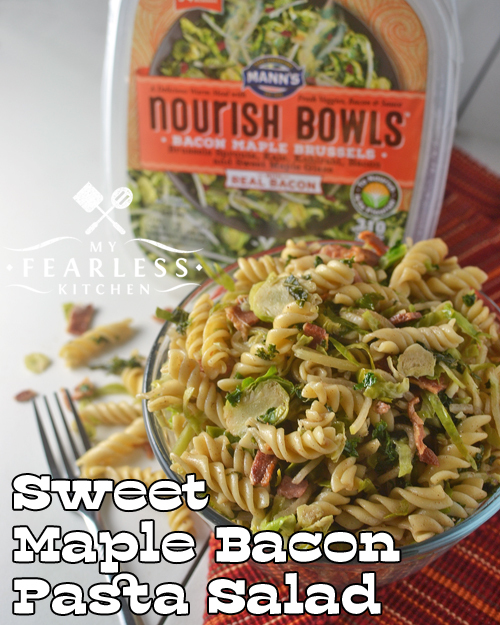 This Sweet Maple Bacon Pasta Salad made with Mann’s Fresh Vegetables Nourish Bowls is delicious! I am always looking for ways to get more vegetables into our meals. So when the folks at Mann’s Fresh Vegetables sent me some of their Nourish Bowls and asked me to create a recipe with them, I was so excited to help! They have 5 varieties of Nourish Bowls (and you can find a coupon on their website). I chose the Maple Bacon Brussels Nourish Bowl to try out… because… well… bacon! This recipe is so easy to whip up. You can do all the prep work while you’re waiting for the water to boil and the pasta to cook. (This is my absolute favorite pot for cooking pasta.) Because the veggies are all washed and chopped for you, it takes practically no time at all to get them ready. Just a quick steam in the microwave and they are done! Seriously. Any recipe that starts with fresh vegetables that are already prepped for me is a winner! One of my favorite things about this recipe is that it has vegetables that we don’t eat often. John and I both actually like Brussels sprouts. (Did you notice the beautiful sliced Brussels sprouts in the pictures?) But we never have them, because I never think about them! And I’ve always sort of thought kale was… not good… but in this recipe, it’s shredded and quickly cooked, so it’s nice and tender with a mild flavor. The matchstick kohlrabi was fun, too! It’s crispy and a little sweet when it’s raw, but soft and tender with a very mild flavor after it’s cooked. And did I mention bacon? What’s a pasta salad without bacon? The Nourish Bowls have real bacon bits, but I added some more bacon. Because you can never have too much bacon. Right? What’s your go-to way to “sneak” some extra veggies into your family’s meals? Which Cooking Oil Should I Use? 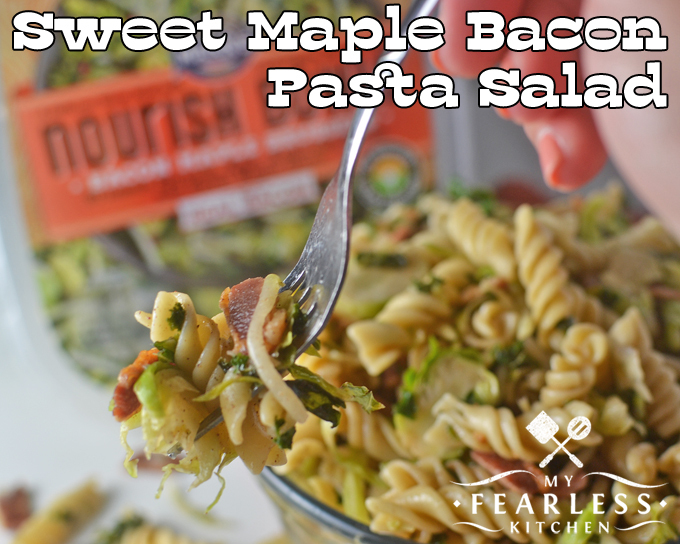 This Sweet Maple Bacon Pasta Salad is packed with fresh vegetables and bacon, and has a lightly sweet dressing. It's perfect for summer picnics, pitch-ins, or a family night in. While pasta is cooking, cook bacon (I like to cook mine in the oven). Drain grease, and set bacon aside to cool. In a small bowl, mix maple syrup, cinnamon, and nutmeg. (Use a fork or a small whisk to get the cinnamon and nutmeg to mix into the syrup.) Set aside. Remove the covers from the Nourish Bowls. Pour the sauce and bacon packets over the vegetables and toss to mix. Place both bowls in the microwave, cover loosely with paper towels, and microwave on high for 4 minutes. Remove paper towels, stir gently, and set aside. When the pasta is cooked, drain it and place it in a large bowl. Toss pasta with the canola oil to keep it from sticking. Add the cooked veggies from the Nourish Bowls to the pasta. Crumble the bacon and add to the pasta. Pour the maple syrup mixture over the pasta. Gently toss to mix and coat the pasta and veggies with the maple dressing. Cover and refrigerate for 1-2 hours, or overnight. This sounds delicious and I’m a sucker for a good pasta salad in the summer! Thanks for sharing in on the #Celebrate365 Summer Dinner Ideas Blog Party! Thanks! 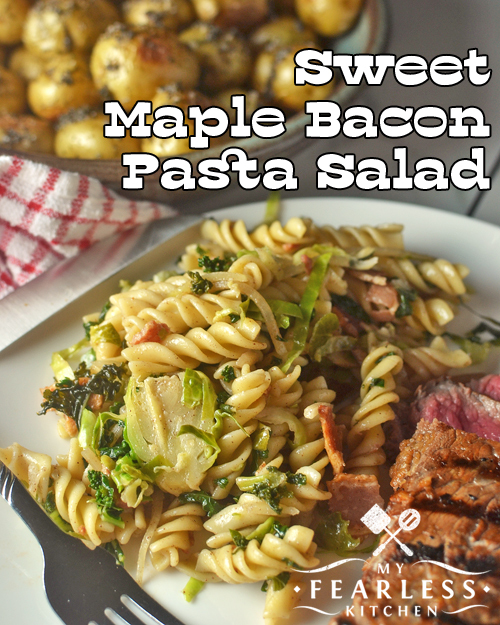 We love this Sweet Maple Bacon Pasta Salad! Thanks for hosting the #Celebrate365 blog party! Pasta Salads are a go to during the summer, but I’m always looking to change it up. This looks delish! I’m obsessed with it this summer! Perfect to pack in a school lunch! Thanks for sharing in our #Celebrate365 Back to School Party! Sounds delicious, but these vegetable bowls aren’t available in the grocery stores around here. I wish they were more widely available!